Why use Maple Heights, OH Property Management company? Why use a Maple Heights, OH Property Management professional property management company? Consider the following. You can feel secure as you use our Maple Heights professional services which work as a system to protect you while maximizing your return on your rental property. Owner clients have reduced risk with our leasing and tenant guarantees as well as our easy out contract. Save money and get your house rented quickly with our professional videos, pictures and descriptions being exposed on 100s of websites and way more. Realty Trust Services 7 point screening process gives landlords the best possible chance of getting a great tenant. Rely on our knowledge to most efficiently prepare your house for rent and select an ideal rental rate. Property owners can rest easy, and get an uninterrupted night’s rest, knowing our 24 x 7 take that midnight call and dispatch help as necessary. Be in the know and head off potential problems before with exhaustive property walk through video reports. We handle all bothersome collection and emotionally exhausting collections calls so focus on family and business. No stress this year when you prepare your taxes because all of the reports will be neatly delivered with your 1099. You have the option to rent, lease option, and / or sell your home, simultaneously, if you want. If the landlord registers his rental property the first time, complies with ALL codes & pays his $75.00 fee, has his tenants register, has no further violations or complaints from anyone about the property and renews his registration on time, before the January 1st of the following year, and all following years, at which time he shows documentation that the tenants and other information on the original application has not changed, then the city will waive the $75.00 fee for each current year that the owner complies with the ordinances and renews his registration on time (before Jan. 1st) and will not re-inspect the property after the 3 year requirement. If the landlord fails to provide this information on time, the fee will be $75.00 up until March 31st of that year, and should the person fail to provide the information on or before March 31 of that year then the fee triples and will cost the landlord $225.00 for the registration. If the tenant does not change, there is no renewal required for the tenant. However, if the tenant or the use of the unit changes, the Certificate of Rental Compliance becomes null and void. The owner would have to apply for a new rental registration and the new tenant would have to apply for a new Certificate of Rental Compliance. The Building Department will not require anything further from the tenant as long as they live there UNLESS the tenant or the use of the property changes, there are legitimate complaints from neighbors (grass, garbage, etc. ), or the Building Department determines new violations in the future. The Certificate of Occupancy must be obtained prior to any occupancy or transfer of title. However, at the discretion of the Building Commissioner, a “temporary transfer of title only Occupancy Permit” may be issued to sell the property with a compliance date for life safety violations. The owner must notify new tenant in writing of the tenant’s requirement to obtain a Certificate of Rental Compliance. Escrow requirements are the same except that the (seller or purchaser) must request “in writing” that the building commissioner prepare an estimate of the violations, and all fees remain the same. Maple Heights is a city in Cuyahoga County, Ohio. As of 2012, the estimated population is 13,821. The population density is 3,160.5/sq mi. 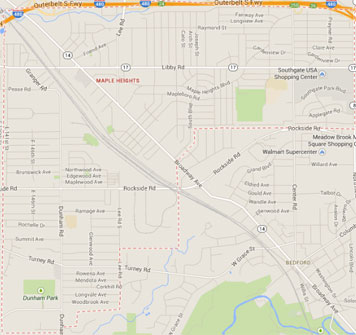 Maple Heights has a land mass of 4.43 sq mi and a water mass of 0.01. Its elevation is 1,033 ft. Maple Heights has only one zip code 44124. Maple Heights has two area codes: 216 and 440.